Thank-you to all who have visited this blog this year. I continue to learn from and be furthur inspired by your comments. Thank-you to fellow bloggers who have posted their writing, photography, and art for me to read and view. You have opened my vision to look deeper. I wish you all a HAPPY NEW YEAR!!! 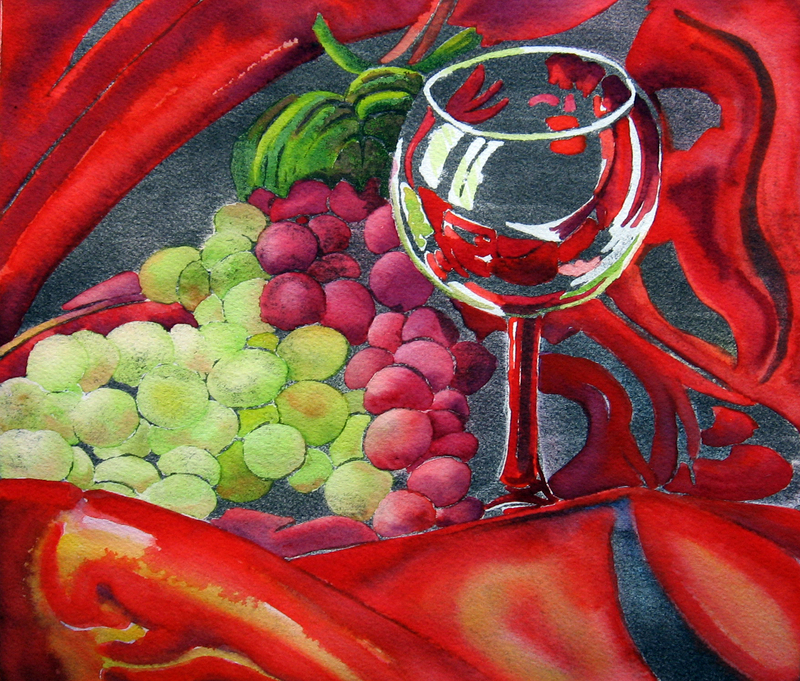 For step-by-step instructions on how to do a gouache resist from start to finish, click here. I challenged myself, two-fold this week. 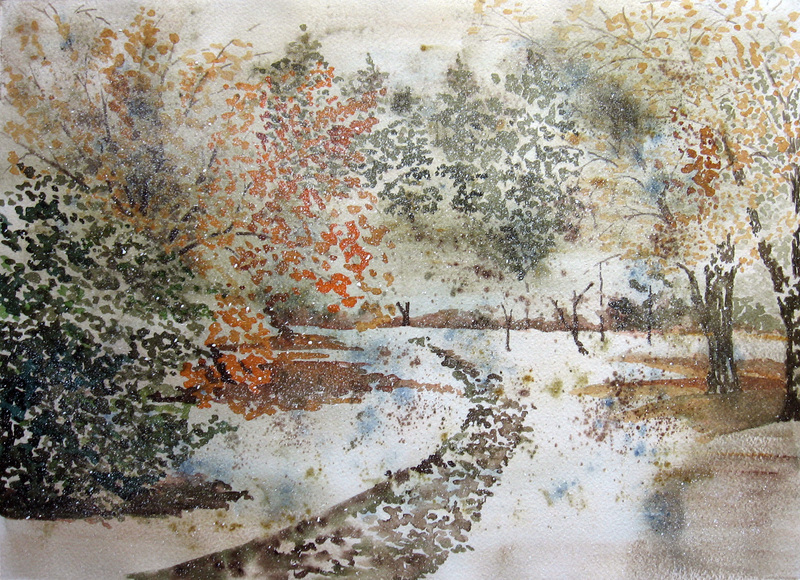 I had read on Stephen Quirke’s blog about how he was enjoying using Arches hotpress paper. 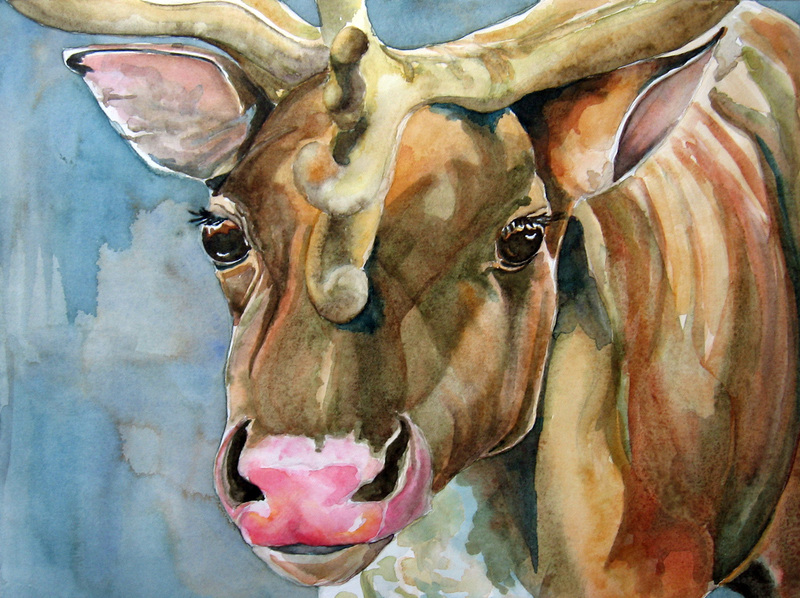 The above portrait of Rudolph was done on 140 lb Arches hotpress paper. 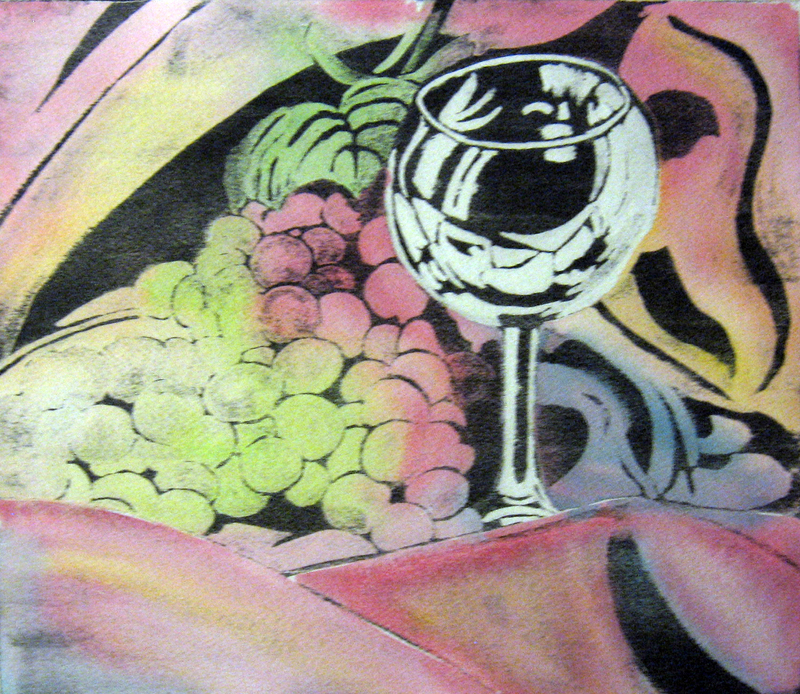 I was amazed that I could paint much of anything on it as I have only been successful with it a couple times. What I have found to be true with this paper is that it is what I call honest. It shows your brush strokes, dries lighter(much) than when I work on coldpress and demands a certain amount of skill. Yes, I followed the basic guidelines of watercolor to create this image. I built my colors up from light to dark and background to foreground. I was able to do a little lifting and softening after paint applications and you can see evidence of this on the light areas of his antlers and the insides of his ears. I like how this paper glows even after applications of numerous washes. Thank-you, Stephen, for giving me a little push through your blog! The other challenge was to create Rudolph decades after my first drawing I did of him in Kindergarten. When I was five, I loved the Gene Autrey version of Rudolph the Red Nose Reindeer. The book was my favorite Christmas story, at the time. It was also one of the first songs I learned to play on the piano. I wanted to give him a believable appearance after all these years of viewing cartoon versions of him. I never saw him as fictitious or cartoon-like. I never bought into believing that Santa, flying reindeer and little elves making toys did not exist. In each and every story and wish that surrounds this holiday, each year, I see evidence of incredible miracles taking place and that is what I wish for all of you this year. Have a wonderful Holiday! I think of these towering pines as Christmas Trees. I truly do. When I first moved to Fort Wayne, I did not have much money but one thing my daughter wanted was a real Christmas tree. Of course, I saved up the extra dollars and went out and bought one and a stand to put it in. We had a lovely tree and the pine smell and the dropped needles and the drying out. I learned that I was to dispose of my tree at a lot set aside for recycling and disposal. I did so. Upon arriving at the lot and stepping out of my car, I paused. There were mounds of trees and I mean MOUNDS!!!! They were in various stages of dryness and pine needles were strewn everywhere. I looked around furthur and saw living pines around the lot. Were they mourning the site as I began to do? I asked myself why I did something so heartless. THAT IS HOW I FELT AT THAT MOMENT. HONEST. Believe me. I pass no judgement on others who still choose to have a real tree, as many do, but at a time when we are talking of global warming and we are realising the decline of our forests, why do we continue to do this? I shared what I had experienced with my daughter and she was touched by what I had seen. Now? We have fake trees that we set up each year and with the same ritual. It is more beautiful to me because I know there is one less tree that gets thrown on that pile. Someone said to me, once, that these trees are specifically raised to sell as Christmas trees. 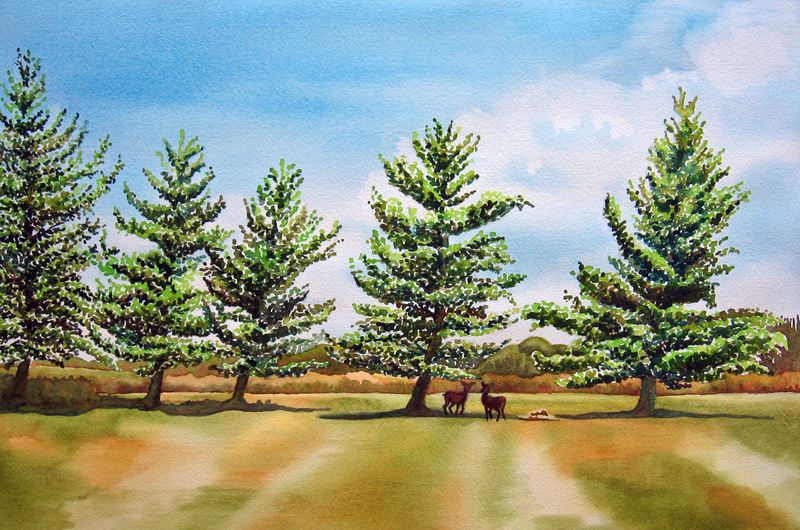 Well, my thoughts are: what a wonderful site to allow these trees, specifically grown to be Christmas trees, to tower and flourish and give off oxygen and provide shade and whisper songs to us thru their branches as these lovely trees did this summer as I sat beneath them and painted. I found them magnificent! 🙂 Stephen Quirke has painted a sentinel, also, here. It rarely happens that we title something the same……. How interesting. A beautiful post about trees, here, by Eva; complete with video! The above painting was painted on soaking wet watercolor paper. 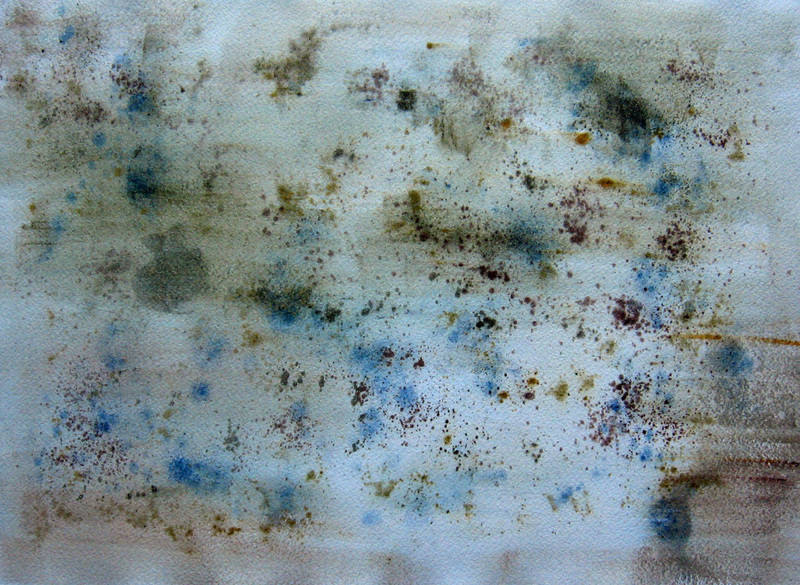 I soaked 140 lb coldpressed Arches watercolor paper in a tub of water until it was completely saturated with water (about 5 to 10 minutes). I then lifted it out and flattened it onto a piece of acrylic with a wet sponge smoothing it out from the center to the sides. Make sure there are no air bubbles underneath the paper. Presence of air bubbles can be seen by a bulge in the surface of the paper. It should lay completely flat to begin. 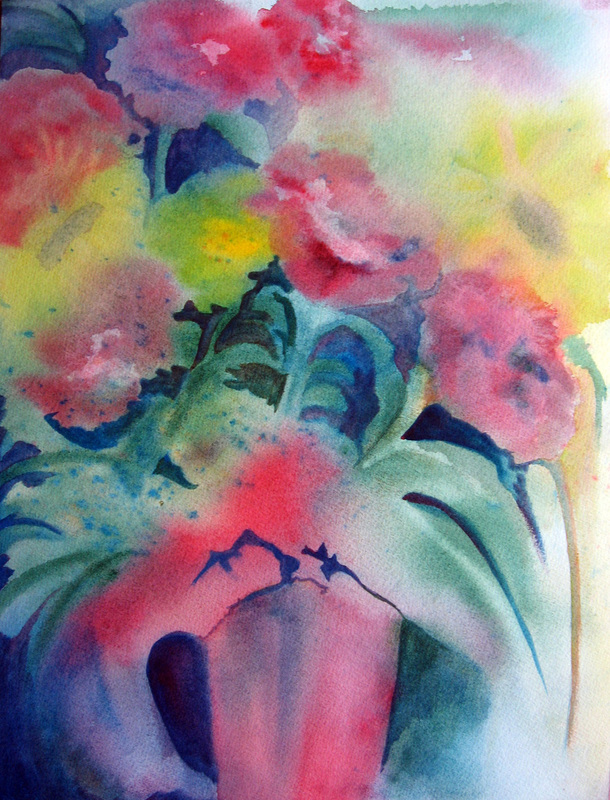 I then begin applying watercolor pigment. It disperses rapidly, at first, so the color is rather weak and light. I usually try to select areas of color. Yellow where I want yellow and red where I want red. I may use several different hues of the same color. They will meet and run together. Once I have the base colors in, I start to shape darker areas in and pay attention to the paper as it dries. The drier it becomes, the more detailed my painting becomes. If I don’t like what I have created or make a big blooper, I run the image under the tap and begin again. There will be some residue of staining pigment left behind each time I rinse but this may enhance the final painting. Before the painting dries, completely, remove it from the acrylic. Because the paper is so wet, pigment does seep around to the backside and can adhere it to the surface of the acrylic and cause tearing during removal. I then lay the drying painting on one of my drawing boards to dry completely. There will be some rippling as it dries, but all of mine have gone flat after being stowed in my portfolio. You can view another painting done, using this technique, here. Yesterday it snowed all day. To celebrate the occasion, my Granddaughter and I sat down to do an art project. I recently purchased a wonderful book titled “ The Usborne Complete Book of ART Ideas” by Fiona Watt. My Granddaughter has paged through it, daily, and selected exercises she has wanted to try. She is 4 and a half (it is important to note the half, she says). She has been fascinated with drawing homes and buildings, lately. One section had a lovely example of city buildings that could be rendered using wax resist and watercolor and she asked if she could do that. We, first drew rectangles in pencil using a ruler and discussing the shapes we were creating. Yes. I have to help her hold the ruler and guide her. This is an exercise that I sit right next to her and help her with as she goes and is one that we do a little and come back to. Her attention span is back and forth. She then colored in the rectangles with different colored crayons and added the moon and the stars with crayons. In the next step, we mixed a large amount of prussian blue watercolor and another container with a large amount of harvest gold (quin gold). 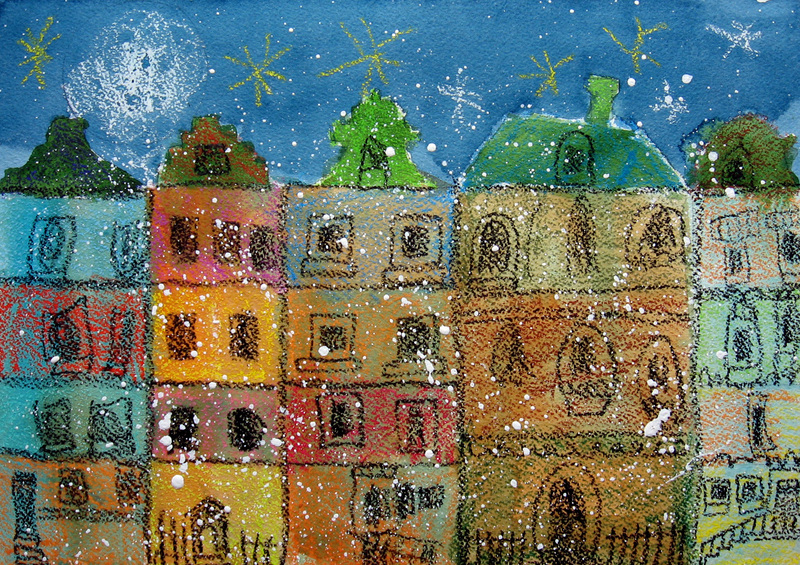 She covered the sky and a portion of the buildings with prussian blue and finished the buildings with harvest gold using a large flat watercolor brush. We then allowed that to dry. In the next step, she looked at the reference in the book and drew in her windows, doors, steps, and fences using a black crayon. To finish our snow day painting, she spattered the snow in with a round brush and white acrylic gesso. After she went home, I decided to paint my own “snow day” painting. One of my students loaned a book to me that had a technique in it that I had not tried before. He thought I might like to see what I could do with it. Thank-you, Henn! The book is “Painting Buildings in Watercolor” by Ranulph Bye. To enhance texture in brick and cobblestone and stone, he uses a technique with oil paint and turpentine. He masks off everything that he does not want to texture with frisket paper. He then mixes three colors of oil paint with turpentine and splatters each color separately onto a pre-wet (with water) area that he wishes to texture. I do not have oil paints but have waterbased oils and turpenoid. I decided to texture an entire piece of watercolor paper using this technique. I mixed, separately, prussian blue, raw sienna, and sepia with some turpentine and splattered them onto my pre wet 140 lb coldpressed watercolor paper. I took it one step further and dragged my flat brush through the paint splatters. The above is what I achieved. Believe me, this is horrendous compared to the beautiful texture that the author of the above book achieved. I liked it, though, and saw a painting wanting to be brought forward. I went in search of winter landscape photo references on wet canvas and came up with two that I liked that I thought had compositions similar to what I saw in my splatters. The above is the painting that came from my textured paper . What I really liked about this is the fog was already there due to the texturing and I just filled in all the negative shapes that were darker in value. I splattered titanium white watercolor with a toothbrush to finish.